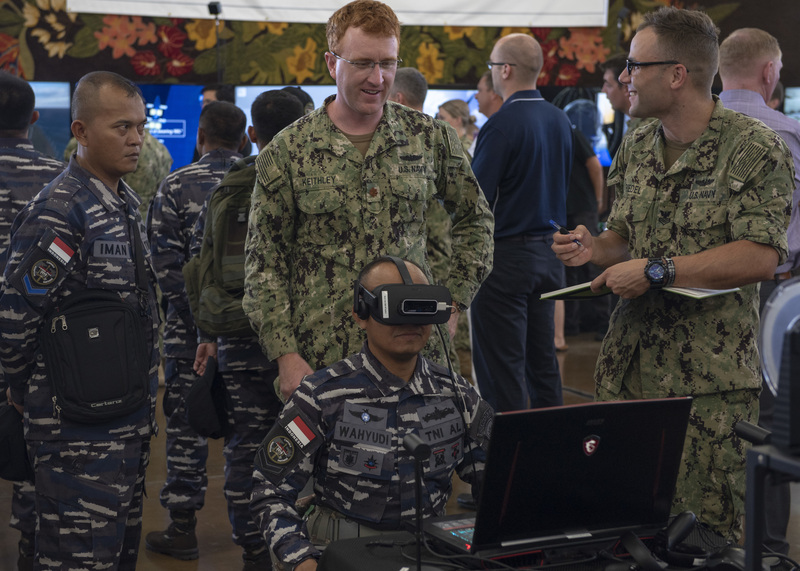 PEARL HARBOR – Countries participating in the Rim of the Pacific 2018 exercise had a chance to show off their most innovative solutions to maritime challenges – from high-end game-changers like a virtual reality system to help corpsmen perform battlefield surgeries, to more simple but highly applicable items like a floating damage control bag. The innovation fair and competition build off of the 2016 RIMPAC’s introduction of innovation as a focus area, and were meant to help the 25 participating countries show off their solutions to common problems – particularly in the areas of port security, humanitarian assistance and disaster relief, virtual and augmented reality, energy, and data and information management – that could be adopted by other nations or could spark other ideas for how to address challenges at home. 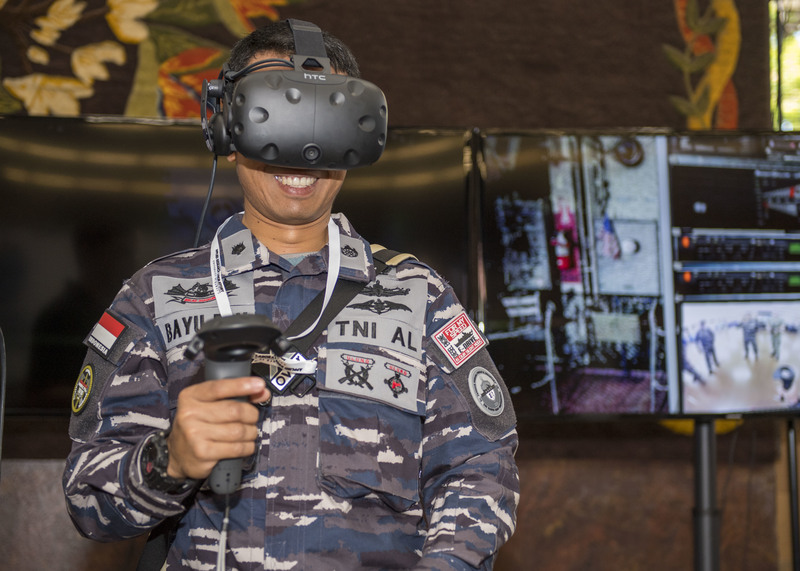 Rim of the Pacific (RIMPAC) 2018 Innovation Fair visitor uses a virtual reality demonstration from the COMSUBPAC Innovation Lab booth, in Joint Base Pearl Harbor-Hickam, June 29. The innovation fair is to accelerate the delivery of innovative capabilities to operators by introducing and demonstrating the capability and technology in an operationally relevant environment. US Navy photo. One innovation that stuck out to Alexander, he said in a press conference with reporters, was a virtual reality system to help Navy corpsmen. “If you have somebody in the field that needs emergency surgery, and you have, say, an independent duty corpsman there, and it doesn’t feel like he has enough expertise to save the individual’s life, then he can put on a virtual headset and he can look at the patient and a doctor thousands of miles away can lead him through a surgery of some sort, and tell him, cut here, don’t cut there, inject these things at this place,” Alexander said. The winning innovation, though, involved no new technology. Rather, the Malaysian Navy presented a floating and reflective damage control (DC) bag that a rapid response team could grab from a flooded compartment. It floats, it has reflective tape on the outside, it has chem lights readily available for personnel to grab, and it organizes other materials in such a way that they could be quickly utilized in an emergency. 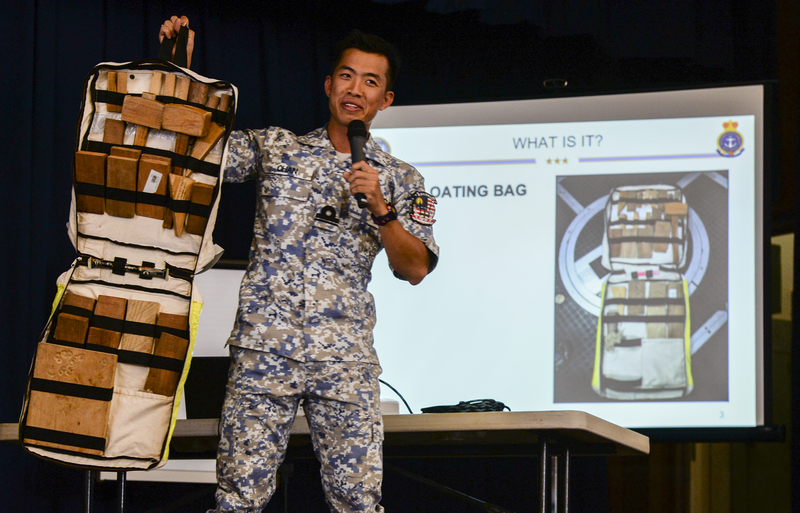 Royal Malaysian Navy Sub-Lieutenant Chan Jun Kwan, assigned to frigate KD Lekiu (FFG 30), displays a damage control floating bag concept developed by his crew during the inaugural Rim of the Pacific (RIMPAC) exercise innovation fair. US Navy photo. “In training we realized that the DC bag is actually not practical when water actually starts coming out, so that’s why we came up with this,” Slt. Chan Jun Kwan, a sub-lieutenant in the Royal Malaysian Navy assigned to frigate KD Lekiu (FFG-30), said during his presentation at the competition. 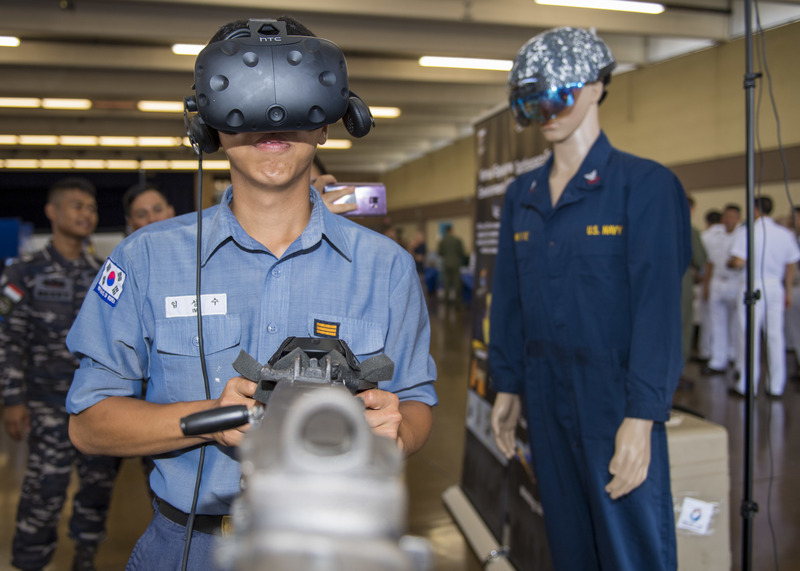 Republic of Korea Navy Seaman Sung Su Im uses BEMR Lab’s Virtual Equipment Environment (V2E) virtual reality system at the Rim of the Pacific (RIMPAC) 2018 Innovation Fair held on Joint Base Pearl Harbor-Hickam, June 28. US Navy photo.